A number of attempts were made in recent years to systematize the enormous source base on burial rites in ancient Thrace. The numerous aspects of the Thracian burial were united in a coherent system under the concept of immortalization ( Гергова 1996). Nevertheless, there remained aspects, notably the burials in sitting position, which only recently attracted the attention of researchers ( Гергова 2000, 2002, 2004). A reason for the marginalization of this interesting aspect is the circumstance that the examples from the Thracian area are not numerous and have not been well documented. Among them are the graves mentioned by F. Kanitz, which are made of slabs or bricks resembling little rooms in which the skeletons are in sitting position, from the village of Shipkovo, Yasenovetz area near Kazanluk, the information about a sitting skeleton in the biggest of the three Rahmanlii tumuli (Шкорпил, 1898, p. 35, 126), as well as the 13 sitting burials discovered below an earth and stone embankment in Tumulus 8 near the village of Gela, Menyov Kamak locality, Smolyan district, dated to the 7th-6th century BC. Two individuals are buried in the centre of the tumulus, surrounded by the remaining eleven who are seated on niches in the rocks (information of V. Naydenova and K. Kissyov). The archaeological research in recent years provided evidence that makes it possible to approach the examining of the issue of the genesis, development and content of this type of burials. The models of chairs-thrones and the real stone thrones discovered in the interior, as well as themes in the painted decoration of tombs, are indisputably closely connected with the theme. R. Tomlison treats the stone thrones in the Macedonian tombs as important evidence that men and women did not use beds but were seated during the ritual feasts. 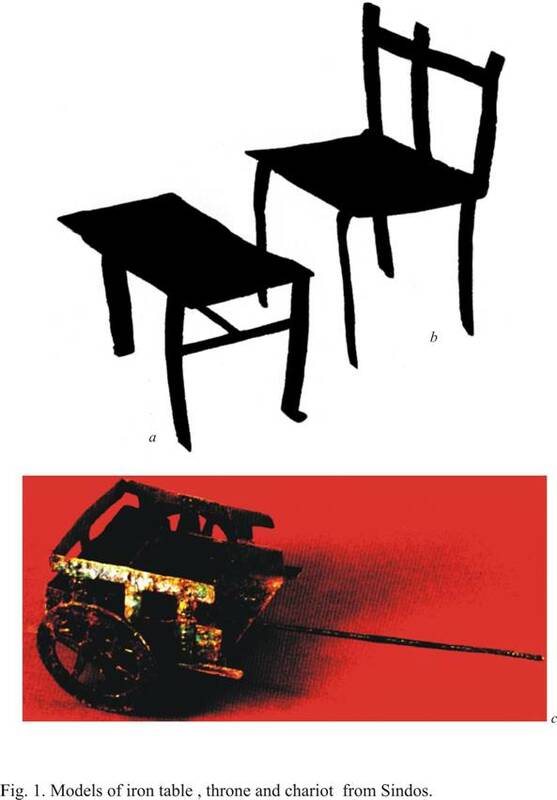 That author associates this practice with the influence and with the traditions of Thrace, indicating the iron models of chairs from the necropolis in Sindos (560-510 BC) (Fig. 1). The cited models are just an element of a specific complex of models of tables and chairs, of chariots loaded with wood, of two-wheeled chariots in which horses modelled from clay are harnessed and accompanied by a third riding horse, of platforms for firewood and skewers depicting ritual scenes (Tomlison 1993). Some authors perceive in its formation the influence of the Cretan-Mycenaean traditions or of Egypt, and only the fragmentary influence of Thrace (Соколовска 1997, 55, 62). The genetic link of this phenomenon with the much earlier traditions of the incrusted ware culture from the Late Bronze Age along the course of the Lower Danube was indicated by D. Gergova (Valeva, Gergova, 2000, 188-189). This culture belongs to a society with a clear religious doctrine and symbolism, which are represented in the burial rites, as well as in the diversity of the labrys models, lozenges and astragals, of male and female idols, thrones and tables, chariots pulled by swans, ornithomorphic vessels, boats, etc. 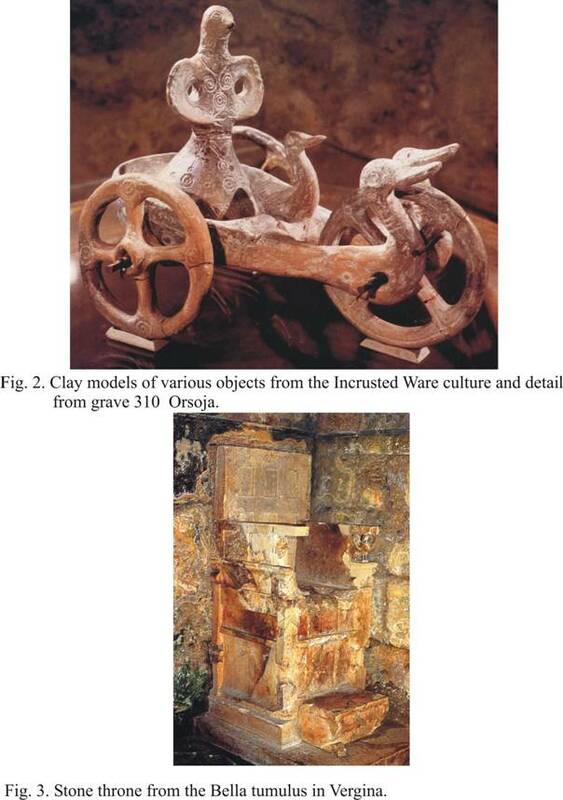 Grave 310 from the necropolis near the village of Orsoja containing an urn with charred bones and a clay throne with a female anthropomorphic idol on it is of special interest. The monuments discovered suggest a link with the idea about the triunity through the cult of the Great Goddess-Mother and of the twins: the lunar Artemis and the solar Apollo, who periodically headed north, to the lands of the Hyperboreans. Both the myth about the Hyperboreans and that about the reincarnation, about the child deity Dionysos Zagreus, are connected with that culture (Бонев 2002, Шалганова 2001) (Fig. 2). Comparative analysis of the asynchronous Late Bronze Age necropoleis from the lands along the Danube and those from the Early Iron Age from Macedonia (Sindos) indicate that the grave complexes with cult objects or scenes – the earlier ones made of clay and the later ones of iron – represent a small percentage of the total number of discovered graves, being found in burials of individuals belonging to different gender and age groups (Шалганова 2001, 2002). Out of eight graves with such models in Sindos, one is the grave of a child, three are female and four are male (Tomlison 1993). This circumstance suggests that the placing of cult objects in the graves is predetermined by the specific social and religious status of a specific social group that can most probably be referred to as priestly or royal-priestly (Гергова 2002). It would be logical to assume a common ideological and ethnic-cultural tradition of that ritual phenomenon. A common doctrinal model with already established norms and burial practices finds a similar material expression and demonstrates a lasting and long-term manifestation. The character of the encrusted ware culture and its links with the Cretan-Mycenaean world, as well as the existence of Thracian personal names and toponyms in texts in Linear A and Linear B scripts from Minoan Crete, emphasise the special closeness between the two cultures and presuppose the probable presence of the same ethnic and cultural elements in the lands along the Danube River and on the Island of Crete. (Порожанов 1998,15-23) . However, the spreading of these innovations in the material and spiritual sphere both in the Balkans and in the Mediterranean region was apparently due to the infiltration of the carriers of the Late Bronze Age culture to the south, to the lands of Thrace and Macedonia. What was actually the role of the throne in cult and burial practices? According to the tradition, the initiation of Pythagoras took place in the cave of the Idean Zeus in the Dikte Mountain on the Island of Crete. He had to spend three times nine days there, and only then he was granted the right to look at the throne of Zeus that was specially draped for the deity every year. According to Porphyry, Pythagoras hammered an inscription on the throne: “Here died and lies buried Zan , who was called Zeus.” Zeus himself ousted another divine creature from the same tomb, because the text goes on: “Here died and lies buried Pikos, who is also Zeus.” Apparently, the deceased who was laid to rest there temporarily blended with the divine nature of the deity. However, that myth had another – matriarchal – form as well. History suggests that Pythagoras took the Orphic rites in all their freshness from Crete into Italy. A seated child was depicted on some of the images of the throne occupied by the symbol of Zeus (Harrison 1977, 57-59). The initiation ceremony for those who are to be initiated – thronosis or the act of sitting – in the Great Eleusinian Mysteries is described in connection with the initiation of Herakles. The scenes depict the initiated individual covered and barefoot, sitting on a strangely shaped chair, covered by a sheepskin, often with heads and horns. The link between the thronosis and the Great Eleusinian Mysteries is also evident from Homer’s hymn to Demeter, who, coming to Eleusis, performed the act that was to be repeated by the persons initiated in her mysteries. Silent and with lowered eyes, she sat on a chair covered with a sheepskin, hiding her face behind a fan (Burkert 1983, 267-268). The finds from Thrace, Macedonia and Greece suggest that precisely the matriarchate variant of the myth was characteristic of the Balkans. The clay model of the Great Goddess-Mother is placed on the throne from grave 310 from Orsoja. 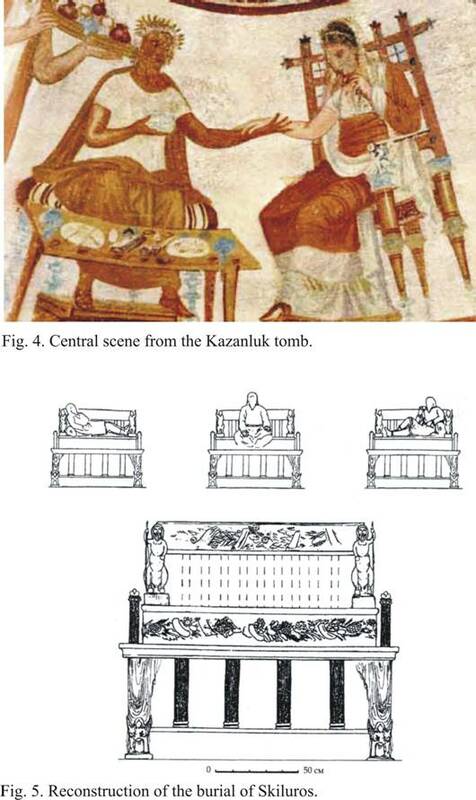 Grave stelae and Hellenistic tombs like the one in Eretria (with two thrones, two beds and a chest) in which ten individuals have been buried (Kurz and Boardmann. 1971, 183) and Vergina – the tomb with the stone throne below the Bella tumulus (Andronikos 1984, 34-37) (Fig. 3), as well as the biggest tholos-tomb in Macedonia, which belonged to a cremated woman aged about 70 years, most probably the mother of Philip II, Eurydice, dated to 344 BC, suggest that the throne was predominantly associated with female burials. The stone throne in the tomb of Eurydice is decorated with splendid painted scenes, among which there are also Hades and Persephone in a quadriga. Their cult, which was not popular among the Greeks, is closely connected with the beliefs of the Macedonians in life after death. The cremation burial performed here was a royal burial. In the central scene in the Kazanluk tomb, which depicts a marital union or a funerary feast, the ruler is sitting on a stool without a back. The throne is occupied by the female figure – the wife, a hypostasis of the Great Goddess-Mother (Живкова 1973) (Fig. 4). This scene, the cited “little rooms” near the village of Shipka, as well as some of the so-called funerary beds that have sizes smaller than is necessary for placing a human body to rest, and symmetrical head rests found in tombs in the necropolis of Shipka-Sheynovo, e.g., Shoushmanetz, (Иванов 2005, in press), give grounds to assume that this practice was known in the area of Southern Thrace as well. The prevailing female burials on a throne suggest that this most representative form of the “immortalization rites” is connected with persons initiated in and related to the servicing of the cult of the Great Mother-Goddess. The Orphics perceived the burial as identical with the initiation, therefore they had special burial practices that concerned only the initiated individuals (Harrison 1980, 597-599). What do we know about the tribes in the regions in which this practice has been documented? The localisation of the necropolis in Sindos presupposes a link with the Thracian tribe of the Sintioi mentioned in the most ancient layer of Homer’s epic works, who lived along the lower course of the Strymon River and in the Aegean islands. According to Philochoros (3rd century BC), the Sintioi were Pelasgians, whereas according to Eratosthenes, they were given that name because they were magicians and because they discovered dangerous herbs (Lazova 1977). It was precisely the sacred language of the Sintioi that was spoken in the Island of Samothrace as well (Marazov 1998, 45). According to Porphyry, they were given that name because they were the first who started making weapons that wound people, and they were also the first brigands. Their migration, together with the other Thracian tribes, started from a common territory that could be localized during the Late Bronze Age along the Danube, from where they penetrated both to the south and to the east, into the Northern Black Sea region, where they gave the name to the Sindoi (Lazova 1977, 141-145). During the Early Iron Age, the Sindoi occupied the coastal strip from Taman almost to Novorossiysk, and they ruled in the strategically located delta of the Kuban River (Федоров 1983, 43-46). At the end of the Bronze Age and the beginning of the Early Iron Age, ceramics, cult objects and items of clothing appeared in the Northern Black Sea region and in the Caucasus, which carried the characteristics of the Late Bronze Age cultures from the Lower Danube and the Carpathian-Danubian basin, forming the basis of some of the leading forms during the Early Iron Age in the Caucasus. The penetration of these elements apparently occurred both by land, directly to the east along the Pontic coast, and by sea (Gergova 1986; Гергова in press). Burials in seated position, as well as secondary burials, began to be practiced in the Caucasian dolmens, which are much earlier than those in Thrace, in the late second and early first millennium BC (Марковин 1966, 294), which became customary for the later slab-like dolmens and especially for the sophisticated multi-element constructions (Марковин 1966, 226-227, 230). The preservation of this tradition in the 7th-4th century BC as well has been attested in the Gelendjik necropolis with subtumular dolmens. The tradition of building stone tombs and later brick tombs in the region along the Kuban River is associated precisely with the Sindoi (Каменецкий 1989, 232-233). The mausoleum-heroon of King Skiluros, discovered in Scythian Naples, is the most eloquent example of the power of that tradition during the next centuries as well. The tomb of King Skiluros is built of stone, two more graves are found above it, and above them there is a building of packed clay. The construction was part of the reconstruction between 130 and 125 BC of the entire Southern Palace with a representative outer appearance. A belt to prevent battering-ram attacks was subsequently built, and the façade was altered. The death of King Skiluros and his transferring in seated position to the throne funerary bed in the stone tomb in 114-113 BC coincided with the first stage of the military campaign of Mithridates. Eight more burials were performed here in 113-112 BC. It is known (Herod. IV, 71) that the representatives of the Scythian aristocracy were mummified in a different way: their bodies were treated with resin and wax, and their entrails were taken out. It is assumed that King Skiluros was mummified in sitting position, and that he was kept somewhere else before he was reburied in that tomb (Зайцев 2003, 59.61). One of the three reconstructions of the sitting posture is with legs crossed under the body. Three horses were sacrificed as an offering and one of the wives of the deceased ruler was buried with him. The pedestal on four legs had a façade decorated with two frontally sitting fantastic animals and two corner columns. Its probable length was 1.40-1.45, i.e., smaller than the length of a normal human body (Fig. 5). The sacrificial table found in the sanctuary of the Acropolis in Pantikapaion with inscription to Ditagoia, from Senamotis, the daughter of Skiluros, as well as hermae of Ditagoia and Hekate in the palace megaron of the Scythian Naples, suggest that the higher Bosporan aristocracy had its own cult complex of the principal female deity Ditagoia (Artemis-Hekate), who was worshipped by the representatives of the royal family of Skiluros (Зайцев 2003, 28-29). The relicts of the language of the Sindoi, which have been preserved in the language relicts, characterize them as carriers of the ancient Indian spoken language, as a fragment of the Proto-Indian tribes that migrated at the end of the second millennium BC across the Caucasian mountain passes into Southern Asia (Федоров 1983, 46). In this light, it is of special interest to note the similarity between some of the megalithic monuments of the Caucasus and India (Dekan Peninsula) , the substitution of the inhumation burial by the secondary burials – a change so significant that the memory was preserved in the literary monuments of Hindustan even until the 11th-12th century, as well as the appearance of iron (Марковин 1978,294-296). The linguistic relicts, the tribal names and the specific burial rites in Thrace and their spreading to the East added new arguments in support of the hypothesis about the spreading of the burial in seated position as an element of an ideological doctrine in the process of the great migrations in the transition to the Iron Age, as well as about the role of the Sintioi in these processes (Гергова 2002). Another localisation of seated deceased individuals directs the attention to the Apennines. Satrianum – the only city comparable to Rome in its significance – was founded during the Early Iron Age between the bays of Tarento and Salerno in Southern Italy, in “Diana’s Valley.” Cremation and inhumation burials have been discovered in the necropolis, as well as the bodies of deceased individuals buried in “Buddha-like” sitting position and holding a cup in their hands, with three skewers, under the body of three of them. Researchers attribute the diversity of the burial practices in the necropolis to the appearance of families in different places (Ross-Holloway 1970, 7, 201-207). The ceramic finds in the necropolis – black and burnished pottery, with corded decoration or ornamental motives consisting of small circles linked with tangents – demonstrates exceptional closeness with the ceramic types in Thrace from the same period. The toponym Satrianum also suggests Southwestern Thrace, in the Pangaion region, between the Strymon and Nestos rivers, and in the area of the Western Rhodope Mountains that abounds in sanctuaries, where the Satrai, through their priestly clan of the Bessoi, dominated the famous sanctuary of Dionysos. Vladimir Georgiev derives the not very certain etymology of the Satrai from the Old-Ind . кsatra-m – power, strength, ksatriya-h – master, prince, nobleman, etc. (Георгиев 1977, 93, Спиридонов 1989, 52-53) During the migration movements in the late second and early first millennium BC, they probably also took part in the dislocation of the Thracian tribes. New evidence from the Celtic area broadens the range of their propagation and provides a fuller idea about the stages of that specific burial practice. The best known examples are from Acy-Romance in the Ardennes, where one of the sacred forests of the Celtic druids, in which they performed their oracles, is located. A D-shaped space surrounded by a trench was discovered in the centre of the cult area of a settlement dated to the 2nd-1st century BC. Cattle are buried in its southern part and horses in its northern area. Below the terrace of an ensemble of five rectangular constructions, 19 young men were buried seated, with heads between their stretched legs, in the early 3rd century BC. Their bodies were dried in 75 cm wide wooden containers until the soft tissues became dry, then they were re-buried once again for the final drying, and finally they were inhumated. Three other men were buried along one line in adjacent square pits oriented to the rising sun. The coffins were placed in upright position, as if the deceased were alive. A bronze statuette of a seated man with crossed legs, together with ritually destroyed weapons from the sanctuary de la Baure (Seine-en Marne) dated to the 4th-1st century BC (Lambot 1998), a skeleton in sitting position of a young man aged about 20 years, without signs of violence, dated with 14C between 400 and 200 BC, discovered in 1992 below a 1st century dwelling on the Geneva Plateau (Haldimann et Moinat, 1999), as well as two similar graves in front of a Gallic-Roman sanctuary from the late 1st century BC in Avenches, suggest again the sacral context of these burials in the Celtic area. These burials are interpreted as human sacrifices or as burials of professional priests (Lambot 1998, Green 2002, 129-135). More than 30 images of a sitting deity with legs crossed below his body are known from the Celtic world, just as the Buddha is often depicted in Indian art in a posture of meditation with crossed legs. Among these images there is also the deity with antlers from the Gundestrup cauldron, which is believed to be a work of some workshop in Northern Thrace and one of the most interesting examples of contacts in the sphere of the cult between the Lower Danubian basin and Northern Europe (Schutz 1983, 292-296). How are the similarities in these burial rites between the eastern and the western part of prehistoric Europe to be treated? Was that a phenomenon of independent appearance among the thrones and the Celts, or a manifestation of permanent relations in the area of religious notions and practices? Ancient authors like Diodorus, Ammianus Marcellinus and others were surprised to learn that the idea of individual immortality was known to the Celtic druids as well. Therefore, they transformed them into members of the closed Pythagorean societies, claiming that the real philosophy was created by the barbarians. According to the Alexandrian sources, the Celtic druids were initiated into the Pythagorean faith precisely by the mythical king, priest and god of the northern Thracian tribe of the Getae, Zalmoxis (Рiggott 1987, 98, 113-116; Dana, Ruscu 2000, 232-233). It is known that the religious reform of Orpheus was precisely one of the factors for the shaping of the specific features of Thracian culture in the late second and early first century BC. The new teaching about the immortality of the soul began to spread persistently, through schools and disciples in newly-established sanctuaries and cult places. Zalmoxis, who preached the ideas about immortality, was not only a predecessor of Pythagoras (according to Herodotus), but he also carried the wisdom of Egypt. For more than a millennium the priests in the Getic society played a remarkable role in the education in supreme wisdom of those who had the noblest descent, persuading them to worship certain deities and sacred places, and thus to dominate both the ordinary people and their kings. These data give grounds to assume that the similar elements in the burial rites of Thracians and Celts concerning those who were initiated and serviced the cult were most probably the consequence of a shared or very close religious system that had spread not only during the infiltration of its carriers into the strategic regions of the Mediterranean and Europe, but also deliberately during the first millennium BC (Гергова 1987, 1996). Burials in a sitting position definitely had their significance and tradition in the hierarchic system of immortalization rites that had been firmly established in Thrace and were indisputably linked with Orphism, which was preserved during the subsequent millennia as well. The ancient nature of that tradition can also be noted in the circumstance that the images of a throne in the Roman catacombs were known only from the tombs that were connected with the Old Testament. The surprising force of the tradition of burials in sitting position in the Thracian area can be perceived from the fact that it was practiced until the mid-20th century in the Central Rhodope Mountains. Initially they were in the centre of the village and later they were moved to the cemetery. After a stipulated period of 3, 5 or 7 years, the bones of all deceased people from the village were re-buried, with the exception of the priest, whose burial was conducted according to a different practice. The funerary procession went in a circle around the entire village and the deceased priest was carried on a special stretcher. Then he was buried seated on a chair and holding a book in his hand in from of the church in which he had officiated in his lifetime (Райчевски 1992). This late example focuses attention on the circumstance that burial on a chair was an element of such burial practices that involved the mandatory re-burying of the bones of the deceased individuals. The actual unearthing of the bones and their taking out was performed only by women until the mid-20th century. They did not use any instruments or tools, they merely patted the earth in a special way with their hands, which made the bones appear on the surface. These skills were passed from mother to daughter. The re-burying of the bones after divining from their color, their washing, the including of the skull in a special feast, as well as the placing of the relics in the ossuary culminated after the filling up of the ossuary-tomb with its piling over with a tumular embankment. This tradition, preserved and accepted in the Christian rites until modern times, again reveals the exceptional role of women, or if they are interpolated in the direction of the earlier throne period – in the ritual system of immortalization. The re-burying of parts of the skeleton, as one of the essential elements of the burial rites, is associated with the need to free the soul from the confinement of matter or of the body. Therefore, it may be assumed that the stone thrones in the Hellenistic tombs were an extremely important element in the burial practices of the initiated individuals and in their immortalization. The present study was aimed at focusing attention on this insufficiently known aspect of the burial practices, which was also poorly attested in archaeological finds. The sophisticated and hierarchically structured system of immortalization rites in which burials in sitting position had their own special social and religious meaning, which was established and was characteristic of Orphic Thrace during the second and first millennium BC, preserved its traditions for two more millennia as well even during the period after the adoption of Christianity till modern times. Бонев 2002 : Бонев Ал. Култови предмети от Северозападна Тракия от късната бронзова епоха и началото на ранножелязната епоха. -Археология, 2002 , 4. Райчевски 1992 . Райчевски Ст. Родопските костници и погребалните обичаи в Южна Тракия.- Българска Етнография 3, кн. 4, 12-18. Соколовска 1997 : Соколовска В. Етничките носители на Требенишката некропола. Ckопиjе- Охрид. Федоров 1983: Федоров Я.А .Историческая этнография Северного Кавказа.Москва. Шалганова 2002 : Шалганова Т. Погребалният обряд- извор за реконструкция на социалната структура.- Проблеми на изкуството, 1, 2002, 26-30. Dana, Ruscu 2000: Dana D., L. Ruscu. Zalmoxis. Addenda to FHD. Thraco-Dacia XXI,1–2, 2000, 223–244. Haldimann et Moinat 1999 : Haldimann M.-A. et. Moinat P. Des hommes et des sacrifices: aux origines celtiques de Genève, Archéologie Suisse, 22, 1999, 170-179. Lazova 1977: Lazova. C. The Thracian tribe Sintians. - Thracia IV, Serdicae, 1977,141-146. Marazov 1998: Marazov I. Between Ares and Orpheus. In: Ancient Gold. The Wealth of the Thracians. Тreasures from the Republic of Bulgaria. Тrust for Museum Exhibitions.